All this week, The Takeout’s Kevin Pang will be cooking from Anthony Bourdain’s Les Halles Cookbook and writing about his experience. Read previous posts about French onion soup, boeuf Bourguignon, pork rillettes, and skate wing Grenobloise. One of the more revealing sections in the cookbook began on page 22, under the deceptively boring header “General Principles.” Here, Bourdain discussed the concept of mise en place (or simply pronounced “meez”), essentially a lesson in prep work, time management, and organization. Its necessity comes down to this: the kitchen is a chaotic place and a head chef is as much pilot as traffic controller. The lesson of intense preparation was front of mind as I cooked my final dish from the Les Halles Cookbook this week: chocolate mousse. Of all the recipes I tried, this one was perhaps too light on details. The pastry chef deals with volatile ingredients like eggs and chocolate, and therefore has less room for error. I can see a less-experienced cook making one misstep and tumbling all the dominos. The steps for chocolate mousse are fairly straightforward: You melt the nicest chocolate you can source, whisk in Grand Marnier, butter, and egg yolks. Separately, you whisk egg whites into soft peaks, gradually folding this mixture into the chocolate, then repeat the process with whipped cream. You do not want the simmering water to come in contact with the double boiler mixing bowl, because this will scorch the chocolate. The instructions in this recipe were somewhat unclear: One could easily presume to take the bowl of chocolate off the double boiler before adding in the Grand Marnier, butter, and eggs. You really ought to keep it on the pot of simmering water, because otherwise, the Grand Marnier will cool the melted chocolate, making it harder to melt in the butter (you’ll want room-temperature butter, anyway). This recipe called for two ounces of Grand Marnier. This is a lot, I am warning you, and the end result is rather boozy. Proceed at your peril or pleasure. In the second stage, right before you fold in the egg whites, you’d want to make sure your chocolate mixture is at room temperature. Warm chocolate is the surest way to deflate your puffy egg whites. 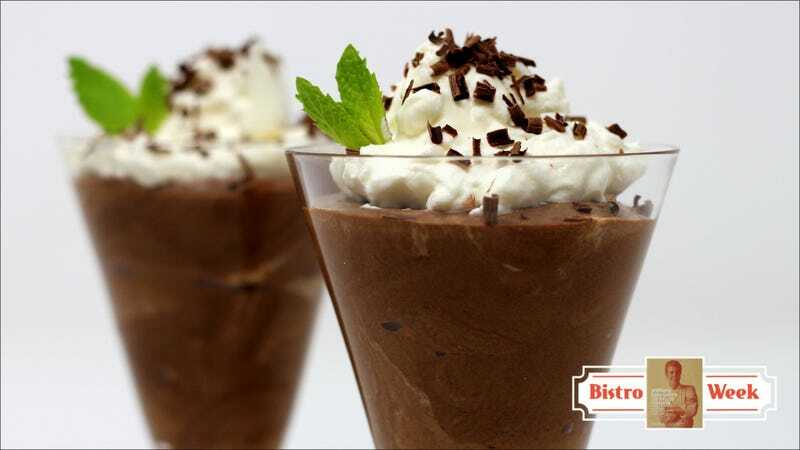 You know what’s a great finishing touch to chocolate mousse? A sprinkle of sea salt or fleur de sel on top. As satisfying weeks go this has been most inspiring, and certainly involved the most butter. I have never dove headfirst into a cuisine as I had with French bistro cooking over these past five days. Much wisdom was imparted from Bourdain and his Les Halles Cookbook —the sheer power of a pithy and uncomplicated recipe, how French cooking can be less complicated than your weeknight recipes, the fact that impressive-sounding dishes are easier to cook than you think, and the thrills of cooking with a blow torch. To echo an earlier sentiment, so often we’re chasing the new shiny object. Then you reach a certain age and discover the beauty and simple pleasures of the classics. It’s not about getting older, it’s just becoming wiser.